Today, we know that directed free-energy is the only technology which can account for the “dustification” of Towers 1 and 2, the subsequent lack of debris, and other phenomena at the World Trade Center. 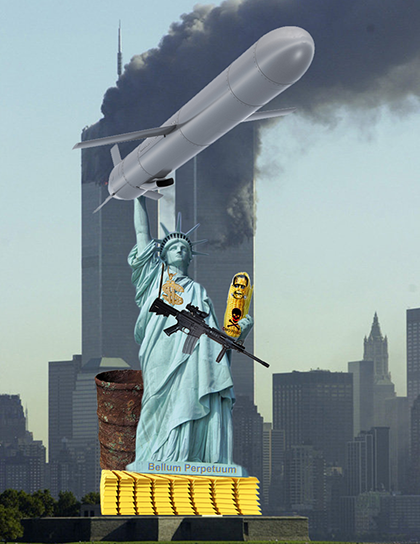 We know that it was impossible for the WTC towers to collapse due to the impact of Boeing 767 aircraft and that it is likely that “cloaked” cruise missiles or military aircraft were used. Further, we know that it is impossible for a Boeing 757 to have crashed into the Pentagon and that it is likely that a “cloaked” cruise missile or a military aircraft was used. 9/11 unshackled a Doppelganger USA upon the world. Since the 60s I’ve suspected that our leaders have often been misdirecting our attention and obscuring their activities from view. I guess they have been hoping we stay so confused that we remain ignorant of their shenanigans and don’t meddle in their world. But, thanks mainly to Freedom of Information Act disclosures, many of my suspicions have been confirmed and a shocking plethora of activities I never imagined possible have been opened to public view. After a period of time, following each of these disclosures, I recovered from my shock and disbelief and tried to make sense of things. Like an amateur detective, I looked for clues and patterns to try to cipher-out the who, what, where… you know… “the facts”. Then the next disclosure came along. And, just like an abuse victim, I went directly into denial, trying to shelter my mind from the facts that compellingly lead to a conclusion that something is definitely going on and what a chump I am for allowing myself to be hoodwinked once again. All this, “OH, NO!! I’ve been hoodwinked again” reflecting has led me to Dr. Lance deHaven-Smith (2.) and his SCAD concept which he describes in his book, Conspiracy Theory in America. SCAD is an acronym for State Crime Against Democracy. Dr. Lance deHaven-Smith coined the term to describe, “Concerted actions or inactions by government insiders intended to manipulate democratic processes and undermine popular sovereignty”. Most of us recoil and hide under the nearest rock when confronted with the idea that people in our government might be involved in or paid to have an official assassinated or a government toppled. We immediately push the thought into a category labeled crazy “conspiracy theories” and go back to the latest episode of The Voice. What I found most compelling about Dr. deHaven-Smith’s presentation is that while our founding fathers expected that people in power would abuse their authority and therefore built-in Constitutional protections against those anticipated abuses, since the 60s, we have lived through many episodes of “criminal activities” that avoided those protections. And, further, those perpetrators have not only succeeded, they have repeatedly succeeded and gone unpunished. I know this is a heavy load to consider. Please check the videos below. 1. Remembering 9/11, Ron Baker, Downriver USA. 2. Dr. Lance deHaven-Smith is a Professor Emeritus in the Reubin O’D. Askew School of Public Administration and Policy at Florida State University. Go here for background.